Frances V. Papiernik, nee Szymanek. June 13, 2018. Age 89. Devoted wife of the late Raymond Papiernik. 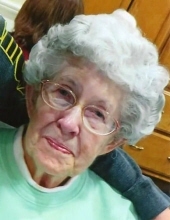 Cherished mother of the late Marian Papiernik. Beloved sister of Frank(Darlene) and Maryanne Szymanek. Fond aunt of many nieces and nephews. Visitation Monday 10:30 A.M. until time of Mass of Christian Burial at 11:30 A.M. at the St. Francis of Assisi Chapel of the Franciscan Village - Mother Theresa Home, 1270 Franciscan Drive, Lemont, IL. 60439. Interment Resurrection Cemetery, Justice, IL. In lieu of flowers, Memorial Offering’s may be made to the Franciscan Village and will be deeply appreciated. To send flowers or a remembrance gift to the family of Frances V. Papiernik, please visit our Tribute Store. "Email Address" would like to share the life celebration of Frances V. Papiernik. Click on the "link" to go to share a favorite memory or leave a condolence message for the family.